Almost seven million adults in the UK – 12% of the adult population – will still be left behind in ten years as a result of digital exclusion. The financial consequences are expected to run into the billions by 2028 unless action is taken now by business and government. This is according to new expert analysis for Good Things Foundation conducted by the Centre for Economics and Business Research (Cebr). In response to these findings, Good Things Foundation is calling on government and other organisations to step up their efforts to support people who are at risk of being left behind. Their new campaign: #BridgingtheDigitalDivide, is calling on Government to commit to helping everyone in the UK able to benefit from the internet by 2028 – in order to realise these £21.8bn of benefits. Good Things Foundation is a social change charity that supports socially excluded people to improve their lives through digital. Through more than 5,000 Online Centres in communities across the UK, Good Things Foundation helps people gain the support and skills they need to change their lives for the better. The report provides a new analysis of the benefits the UK is missing out on by not ensuring local support for people to gain basic digital skills progresses in parallel with technological changes. The startling figures shine a light on an often-overlooked trend; with more and more services moving to digital platforms to save money, digital literacy needed to use these services is not keeping pace. o £1.1bn in time savings from financial and government transactions moving online. o £570m added to the economy in earnings benefit from increasing individuals’ income, and government gains from higher NICs and tax receipts. o £313m in employment benefits from previously unemployed people entering the workforce due to being upskilled through digital training. o £1.1bn from cost savings in online transactions during shopping. o £400m communication benefits from greater online community access reducing social isolation. The report assumes that connected individuals will then invest more of their disposable income to recreational and cultural activities. o £141m NHS savings from increased use of digital services. o £487m in government savings from digital efficiency and increased use of online services. o £1.5bn in corporate benefits from increased productivity through greater digital skills in the workforce. • Providing everyone in the UK with the essential digital skills they need by 2028 will lead to a benefit of £15 for every £1 invested. 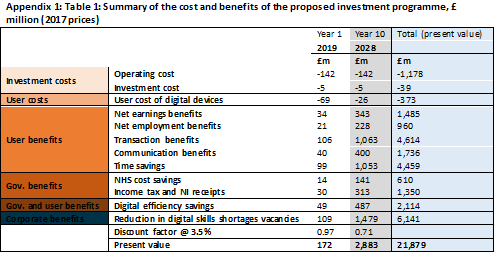 Drawing on detailed economic modelling, the report finds that the saving to the NHS alone will more than pay for the cost to provide the digital skills training and support needed to upskill the entire UK population. As part of their new campaign, Good Things Foundation is calling for Government and companies throughout the UK to pledge their commitment to achieving a 100% digital included nation by 2028. In addition to taking action themselves, they are highlighting the extensive work that is already being done in digital inclusion and recommending practical methods for key stakeholders in government and business to ensure the UK becomes fully digitally inclusive. Their campaign, #BridgingtheDigitalDivide asks for organisations throughout the UK to join the campaign by sharing success stories of digital inclusion and pledging to do more to close the gap. Good Things Foundation has developed resources to help organisations and individuals understand what they can do to promote full digital inclusion. “The UK could be the first 100% digitally included nation and this report shows there is a clear economic case for investing. So we’re calling on government and businesses to commit to getting everyone online in the next ten years. Those who profit most from digitisation have a responsibility to help improve digital inclusion. But there is also a clear case for acting now. It is unacceptable that so many people are being left behind, and the report we’ve commissioned underlines the urgency of stepping up our efforts. “For many people we see, it’s the first time they’ve created an email address or even used a computer. When they’re made aware of the vast amount of services and opportunities available to them, they take that information and share it with family and friends. It creates intergenerational learning, so we see more and more people benefitting from digital inclusion. “From using Skype to contact friends and relatives, understanding new welfare systems such as Universal Credit and learning how to save money online, we’re able to take people from a state of isolation, to one of empowerment, all through digital inclusion. “We have helped nearly 5000 people and their families since March 2017 and their lives have been transformed through digital empowerment.